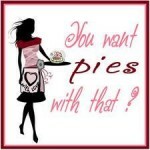 Posted by Madam Chow Published in fruit, pie, You Want Pies With That? For the inaugural launch of “You Want Pies With That?,” the first thing that popped into my head with the pie fight near the end of that great American comedy classic, The Great Race. You see, the theme this month is “I LOVE That Movie!” And I DO love that movie – when my brother and I were little, it was one of the few shows we could agree to watch (without fighting). Directed by Blake Edwards, it starred Tony Curtis, Jack Lemon, Natalie Wood, and Peter Falk. What a cast. I had to take this over to someone’s house for dinner, so I baked it in a pie dish for easy transport and it worked out wonderfully. And it was the only time I’ve ever had the hosts keep ALL the leftovers (what little remained) – MISSION ACCOMPLISHED! I used Dorie Greenspan’s wonderful pie crust recipe, substituting low fat cream cheese for the shortening. I spread a thin layer of this amazing mariposa plum jam on the bottom of the dough, sprinkled that with crushed amaretti cookies, and piled it high with plums, nectarines, and even an apricot or two that I had laying about. Finally, I painted an egg wash on the crust, sprinkled it with sugar, and popped it in a 425 F oven until golden brown and bubbly. Needless to say, the dessert was fantastic. Unlike the characters in The Great Race, we did not throw it at each other. I suspect that the four of us would have polished off the pie, but we didn’t want to look like total pigs. Be sure to head over to You Want Pies With That? to see what other pies everyone decided to bake! I think you should have made one to throw, just for verisimilitude. Now I might need to watch this movie, so that I can 100% get the reference. In the meantime, that’s one tasty looking galette. HA HA HA That is my movie choice, too! It’s one of my all-time favorites. Made a different pie, though. Any pie is fine with me. Looks great! I haven’t seen that movie, but will add it to my list. What a fun pie challenge. Great looking pie!! I almost chose this movie too! Beautiful!!! Mine didn’tlook nearly so presentable! I am so new to baking that I did not know you could sub cream cheese for shortening in a crust…but you can bet I will now!! Ooh! How Greenspan of you! But…no throwing? How funny that you and Judy did the same movie! Did you two pass notes before class?? And I learned something new, too – I didn’t know you could sub cream cheese for shortening. 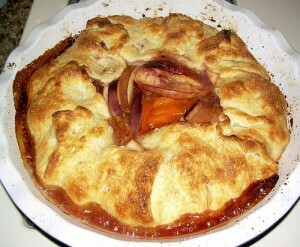 I will try that with my next pie crust! I’ve never thought to substitute cream cheese with shortening – I’m going to try that some time! Yum, I loved Dorie’s gallete recipe and the cream cheese sub in the pastry sounds downright sinful! Wow! Looks great! Your friends are very lucky. I had better hurry up and post my pie (I am slacking today!). Two pies based on this movie? I have to rent it now. Your galette looks so good. Great looking pie and movie! This sure was fun! I love that movie too! So fun. Your yummy galette looks wonderful! Boy, does that sound good! I like the idea of sprinkling amaretti in the bottom. Yummers! Nice looking pie and great movie choice!!! I just adore them both – great job! Sounds delicious! And I need to see this movie. I love Natalie Wood. I would have kept the leftovers, too! That looks amazing! This does look fantastic! And I’m sure it tasted wonderful!